As in other developed insurance markets, Japanese (re)insurers are struggling to bounce back while investment returns remain low and prices continue to soften. And there is widespread anticipation of further premium rate softening as Japan readies itself for the all-important 1 April renewals. Dominated by three main insurance groups – MS&AD Insurance Group, Tokio Marine Group and NKSJ Group – following a recent spate of consolidation, as well as local reinsurer Toa Re, the market is yet to see any real improvement in investment returns since the financial crisis peaked in 2008. Rates continue to be pitched at levels that are expected to make only a modest profit for insurers, with low volatility in pricing. However, given a favourable claims experience in recent years and the opportunity to diversify portfolios geographically for international (re)insurers, it remains a popular market with plenty of competition. Despite being a peak zone for international reinsurers, the Japanese market has escaped sizable losses in recent years. It was largely unaffected by Typhoon Melor in October 2009, the first typhoon to make landfall in Japan since 2007, with total claims amounting to ¥50bn ($600m). In fact, the catastrophe experience has been relatively quiet since 2004, when Japan was hit by a record-breaking 10 typhoons, with insured losses totalling $6bn. The largest loss was from Typhoon Songda, at $3.6bn. The country was also rocked by a major earthquake in Niigata in 2004, with an insured loss of $600m. The 1990s, in contrast, was a period of intense catastrophe activity, which included the Kobe earthquake in 1995 and the Mireille (1991) and Bart (1999) typhoons. These caused insured losses of $3.5bn, $8.9bn and $5.2bn, respectively. Despite the low level of recent catastrophes in recent years, demand for catastrophe reinsurance remains high as insured values continue to grow in some of Japan’s most exposed cities. Earthquake and windstorm continue to dominate as the two main perils, but flood, volcanic eruption, tsunami and winter storms are also major hazards. For most reinsurers, a Tokyo earthquake is one of the major loss scenarios. Lloyd’s Realistic Disaster Scenarios (RDS) for 2011 looked at the likely consequences if an event like the Great Kanto earthquake of 1923 were to occur today. Then, 142,800 people died; today, such an event is unlikely to cause more than 2,000 deaths, thanks to better building regulations, but it would still cost insurers and reinsurers an estimated ¥5 trillion in property damage. All other lines of business would be affected by such a major catastrophes, with significant losses for marine, personal accident, liability and business interruption. Secondary perils following earthquakes also have great loss potential – particularly for fires following earthquakes and tsunamis. According to Risk Management Solutions (RMS) in a report on catastrophe mortality in Japan, the growth of coastal populations in Japan has significantly increased the country’s exposure to tsunamis. Over 9.6 million people live within 2km of the main coastline, which accounts for up to 77% of the entire population. Despite continued investment in coastal defences and warning systems, a tsunami generated by a large magnitude earthquake on the Nankai Trough that produces a 10-20 metre wave run-up along parts of the coastlines of Shikoku and Kyushu, and 5 metre wave run-up along the coastline of southern Honshu, could cause significant damage. This scenario could cause 37,000 deaths. Windstorm is another major peril in Japan. According to the Lloyd’s RDS an event based on the Isewan (Vera) typhoon of 1959 is likely to result in an industry property loss of ¥1 trillion if it happened today. Other classes likely to be severely affected include marine, specie and fine art, personal accident, aviation and liability. Unsurprisingly, given these catastrophe exposures, an increasing amount of risk has been transferred to the capital markets in recent years via cat bonds and other insurance-linked securities. One of the most recent transactions include last December’s $210m Montana Re issuance, structured by GC Securities on behalf of Flagstone Re, to protect against US hurricane, US earthquake, Europe windstorm, Japan typhoon, Japan earthquake risks and, for the first time, Cayman windstorm. The bond uses the RMS Paradex index as a trigger. It follows SCOR’s second issuance under Atlas VI Capital of €60m ($60.7m), to protect against European windstorms and Japanese earthquakes. Japan’s non-life market size has settled at around $100bn over the past nine years, having peaked at $106bn in 2008. This makes it the fourth largest in the world, accounting for 5.78% of total global premiums. Only the USA, the UK and Germany are bigger. Of the 50 insurers in the market, around 30 are domestic carriers while 20 are foreign direct insurers. While non-life insurers returned to profit in 2009 following the financial crisis, underwriting results remained “lacklustre”, writes rating agency Standard & Poor’s in its June 2010 report on the market. The top nine rated non-life companies posted a net profit of ¥197.5bn, up from the previous year’s loss of ¥65.4bn. Japan’s mature insurance market has been the focus of intense consolidation over the past two years, with the three main groups now accounting for 84% of the market, according to 2010 figures. With premiums steadily shrinking across all major lines of business over the past decade, there have been few opportunities for growth. This is unlikely to change any time soon, with a declining and aging population contributing to the steady reduction in premiums. Some insurers have been forced to merge. In April 2010, Mitsui Sumitomo, Aioi and Nissay Dowa joined to form MS&AD Insurance Group. Within this grouping, Aioi and Nissay Dowa then merged on 1 October 2010 to form Aioi Nissay Dowa. 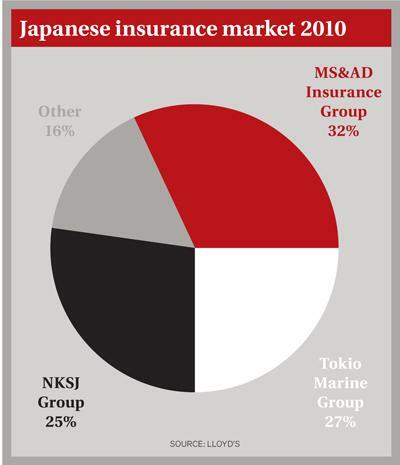 The emergence of the three mega groups – MS&AD, NKSJ and Tokio Marine – heralds a new era of fierce competition, according to S&P, as direct marketing insurers increase their participation in the sector. Following its creation in 2010 MS&AD became the biggest insurance group in Japan, deposing previous market leader Tokio Marine. As the only domestically incorporated reinsurance company operating in both local and international markets, Toa Re continues to dominate the reinsurance scene. The A+ rated reinsurer wrote total net premiums of ¥143bn during the year ending 31 March 2010. Many of the major international reinsurers also have a significant presence in the market, though the bigger or difficult-to-place risks are ceded to the international markets such as London, Bermuda and Europe. Despite two decades of deregulation, barriers to entry to the market for foreign (re)insurers remain. Relationships continue to be important in a market where brand recognition is vital, and there is strong customer loyalty to the large traditional Japanese carriers. However, many foreign companies are continuing to increase their market share – Lloyd’s premiums grew by 27% from $537m in 2008 to $680m in 2009 – with a strategy based on finding alternative distribution channels and challenging brand misperceptions that Lloyd’s is a market of last resort only for specialist lines of business. Broker distribution in the insurance market remains in its infancy, with the majority of business placed via agents and direct distribution. But it holds a great deal of potential, particularly if the experience of reinsurance intermediaries is anything to go by.